Epson announces its fastest sheet-fed scanner range, the WorkForce DS-970 and DS-870, which are highly reliable devices for high-pressure environments such as the healthcare, legal and financial sectors. With market-leading capture speeds of 85ppm, or 170ipm, a high-capacity 100-sheet ADF and advanced job processing features, they prove invaluable in any business workflow. Both offer a new colour LCD panel to improve ease of use for device and job control functions, while onboard sensors and innovative software combine to boost productivity and image quality. The scanners now feature USB 3 for faster data transfer and an improved duty cycle, so users can scan up to 9000 pages per day on the DS-970 and 7000 pages per day on the DS-870. 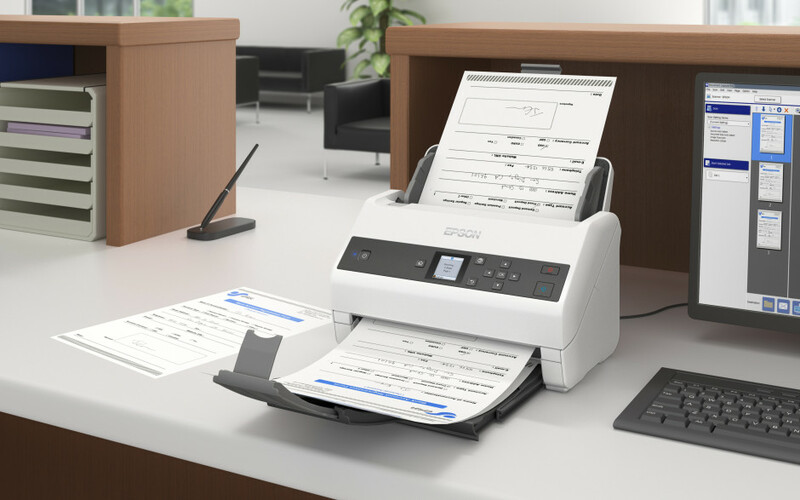 Users need not worry about variations in documents they need to capture – both models offer Epson’s widest media handling from 27gsm to 413gsm and long paper scanning mode up to 6096mm. For documents that cannot be scanned via the ADF – customers can choose from three different flatbed solutions up to A3 in size. The optional network panel enables the DS-870 and DS-970 to be shared between users and departments. Both devices come with Document Capture Pro and Epson Scan software: Epson Scan software is designed for advanced imaging technology such as searchable PDFs, advanced colour dropout and automatic de-skew. Epson’s Document Capture Pro features job profile creation that enables individuals to scan, save and share information around the business effortlessly. Advanced features for naming, separating and routing documents makes scanning simple and logical. Save and send files like PDF, jpeg, tiff and other formats. The WorkForce DS-870 and DS-970 are available from 1 stFebruary 2019, priced at €699 and €949 respectively. In the departmental scanner category as defined by InfoSource as the new WorkForce DS-970 will be the fastest scanner in terms of speed. Comparing to the market leader as per annual sales in 2017 again using InfoSource (Fujitsu fi-7180) the DS-970 has the duty cycle of 9000 pages per day vs the Fujitsu fi-7140 – 6000 pages per day. Data taken from manufacturer’s own website on 7th August 2018.